What Other Symptoms Might Be OCD? OCD symptoms can be as varied as the people who have them. But there are some “warning signs” that can indicate OCD or another disorder. 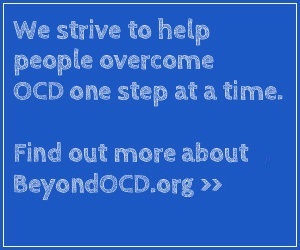 Remember, OCD and other disorders ARE treatable. Noticing what’s wrong is a step in the right direction toward getting better. OCD doesn’t have to rule your life. If you’re struggling with symptoms like the ones you’ve read about on this web site, ask your parents to help you get treatment for OCD. It won’t go away by itself. Could any of these situations describe your situation? You take so much time getting dressed in the morning that you’re constantly late for school. Or between classes, you have to perform certain actions (like checking the lock on your locker) or mental rituals (such as praying, counting, saying certain phrases) over and over again, so you’re late for the next class. Maybe you have to open and close your locker a certain number of times, or count your steps while you walk down a hallway. Or when you’re leaving a room, you have to keep going in and out of it until it finally feels OK to leave it. This could also happen when you’re going up and down stairs – you have to go up and down the stairs so many times in order to feel “right,” that you’re exhausted and late for your ride, the bus, your next class, meals, etc. You have a lot of trouble paying attention in class or concentrating on homework assignments because you’re constantly thinking about your fears or “bad” thoughts, and trying not to perform the actions that would temporarily make you feel better. No matter how hard you try to get rid of the thoughts, they just won’t go away. And you’d be embarrassed if anyone saw you perform your compulsive actions in class or in public. You’re not able to complete in-class assignments or homework assignments because they’re “not done well enough” or aren’t “right,” and you always seem to run out of time. Your compulsive actions take up so much time at night that, not only is your homework not done, you’re also up so late that you’re not getting enough sleep. And you’re so tired the next day you can barely make it through your classes. You used to get good grades, but now your grades have really slipped (and you realize it’s because the obsessions and compulsions are getting in the way of studying, participating in class or completing homework assignments). Your uncontrollable fears, worries and unwanted thoughts are severely straining a relationship – at home, with friends, or at school. You’re afraid you might seriously hurt someone because you can’t stop thinking about hurting them, or you keep having violent or bizarre thoughts about harming others. You believe your thoughts can actually cause things to happen or not happen. If any of this sounds like you (or someone you know), speak up. As hard as it might be to ask for help or to talk about obsessions and compulsions with your parents or someone at school, living with OCD is much harder. The sooner you start getting treatment, the sooner you can start being more like the YOU you used to be. You secretly pull out hair, bite your nails, or pick at your skin. At first, you didn’t worry too much about it, but now you’re starting to see some “bare” spots in your hair, or your nails are so bitten that they bleed. Maybe the spots where you’ve picked at your skin are starting to develop sores or scabs, but you continue to pick at them. Now you’re afraid people will notice, but you can’t stop. It’s very important to ask for help before these disorders get worse. Sometimes there are related disorders that are not OCD but may occur along with OCD. These include depression, attention-deficit disorders, tic disorders (body, facial or vocal twitches or sounds), bipolar disorder, panic disorders (“panic attacks”), or feeling alienated from everyone else. It may seem you’ve always been concerned about your weight, but now you’re “obsessed” with it, constantly reviewing your appearance. Maybe you’re not eating very much, or making yourself vomit after a meal to keep from gaining weight. These symptoms aren’t just different; they can be dangerous to your health. While it may be hard to tell your parents or a teacher you trust that you’re experiencing symptoms that are just “not YOU,” you can get better a lot faster if you don’t keep hiding the symptoms. You need to be evaluated by a doctor so you can get the right treatment for the right problem. You owe it to yourself to get better, and get back to enjoying life!